The field proven Military Power� UPS line is ideally suited for military, industrial, computer and telecommunications applications requiring high reliability, rugged construction, compact size and light weight design. These units are equally suited for use in shipboard, airborne, vehicular, field deployed or fixed locations with controlled or uncontrolled environments. The ETI0001-1443 was specifically designed to meet the stringent requirements of Boeing for use in multiple programs. 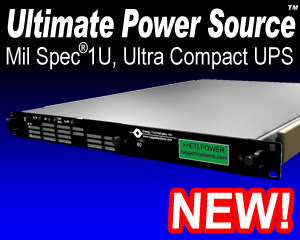 The ETI0001-1443 does not require a separate PDU since the PDU functions are already integrated into the UPS module. This saves rack space, cabling and expense while improving overall reliability. The internal shielded input transformer provides galvanic isolation with provisions for both domestic (115 VAC, CONUS) and optional autoranging international input voltages (85-270 VAC, OCONUS). Special EMI/RFI filters and input power factor correction minimize both input current and harmonics. The input circuit breaker and the galvanic isolation transformer all provide a double pole isolated source for all installations including shipboard systems or overseas locations where phase references and grounding are not consistent. The Elapsed Time Indicator records the number of operational hours for records and scheduling preventative maintenance of attached equipment. The front and rear panels also provide easy access to both the AC Input and Battery Input fuses. Coupled with the adjacent spare fuses, MTTR is reduced to less than 15 minutes. The high intensity audible alarm can be heard in high noise environments and includes an audible enable/disable switch. All controls and protective devices are brought to the front and rear panels with critical switches or breakers guarded. Further, all front panel devices are recessed to prevent damage or accidental operation. The internal intelligent PDU allows control of the individual output circuits incorporating thermal and interlock interfaces for additional control and safety, plus Battleshort override. Battleshort can be engaged via the front panel control to override thermal shutdown. When in Battleshort, an audible alarm is sounded and an indicator is lit. The display and control panel can be mounted remotely in the rack at eye level, or on the keyboard console, or on the unit front panel with only a logic level cable connection. The rear panel provides locking connectors for the input and output power with various optional configurations available. The output connectors are unique MS threaded metal shell connectors, each "clocked" differently so only one cable can go to each output. This unit draws air through the front air filter and exhausts out the rear vent into the rack. This allows the unit to be used in either negative or neutral pressure racks. The fan is a special extra quiet version to keep the unit's overall audible level below 44 dB.